The question I have is that my dentist told me that in the near future I would need ALL TEETH pulled. Both my parents had it done at an early age (dad 37, mom 39). They both got dentures. I am only 25 and they see the same problems. I brush all the time but I was told I have soft teeth? If I have ALL TEETH pulled I don’t want dentures. I want the ones that don’t come out :). What would that be called? and how much would it cost? How long would it take? Hopefully all can be done in one day. This is very sad. If you follow through with this course of action, you will be a dental cripple around the age of 50. Having your teeth taken out that young causes your body to resorb the bone in your jaw, and thus your jaw will gradually shrink until there is practically nothing left. Imagine yourself with a thin sliver of a jawbone in 25 or 30 years. I’ve seen a number patients like that and it’s difficult to do anything for them. They don’t even have enough bone left to anchor a dental implant. I have heard many dentists blame high rates of tooth decay in certain individuals on “soft teeth.” However, I spent quite a bit of time when I was in dental school examining this issue of high rates of decay and what caused them. I spent hours in our dental library, checking out research articles and reading all I could about it. I could find no research to back up this notion. Check it out yourself. Google “soft teeth” and “research” and see if you can come up with anything—you won’t find any research that supports the notion. What the research supports is frequency of eating as the cause of excessive tooth decay. I can also tell you that as a chemist before going to dental school, the idea that enamel that was slightly softer is more susceptible to tooth decay doesn’t jive with the chemistry of decay. The decay process is not so much a matter of softness or hardness of the enamel, but with the chemical structure of it. Bacteria latch onto the enamel, produce acids, and the acids dissolve the enamel. How fast something dissolves isn’t proportional to its hardness or softness. Porosity of the enamel would make it more vulnerable, but not softness. This is assuming basic, intact enamel that I couldn’t puncture with an explorer, which is what I saw on every patient I ever examined. 1. A few of them had a disease that caused dry mouth—they had practically no saliva, and saliva is the main defense against decay. This was the case with about two patients in the history of my practice. 2. All the rest of them had a habit of snacking during the day. There is no way that frequent toothbrushing can make up for frequent snacking. Even if you brush after every little nibble, the places where you tend to get decay are usually out of reach of the toothbrush. Read our page about tooth decay for an understanding of the decay process. 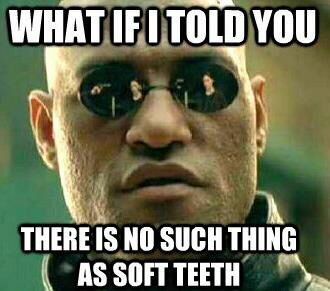 Patient: Why do I get all these cavities when I brush all the time? Me: How often do you eat? And I’d suggest you go to a dentist who tries a little harder to save teeth. There are dentists who make excuses and there are dentists who try to find solutions. What you’re telling me puts your dentist more in the first category than the second. So save any teeth you can for as long as you can. You can get removable partial dentures to anchor to the ones that are left. You can get dental implants. There are a number of options to replace missing teeth. They all require some time and a couple of appointments at least, though. I’m not sure why you would want it all in one day. You can get the new dentures put in the same day as your teeth are extracted, usually, but you can’t get everything in one visit. Doing dentures properly requires a number of steps with lab work in between. When you get your dentures the same day the teeth are extracted, you will usually have had several preparatory appointments before that for taking impressions and measurements, etc. I don’t want to get into the costs and things, because I can’t examine your mouth to tell you what you need. But I really encourage you to find a dentist who is more concerned about your long-term welfare and see what he or she says are your options and the costs, etc. A dentist saying you have soft teeth to me is just an excuse for not wanting to go through the trouble it would take to help you keep your teeth.